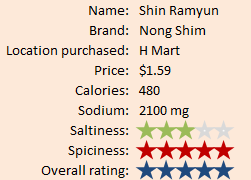 Nong Shim Shin Ramyun (辛拉麵, 신라면) package. Here's a brick noodle that I've had many times before, but don't eat as often due to it being a little more pricey than Top Ramen. The first time I had it was over at a friend's house when I visited them in California. His family is Korean and his mother made this soup for us for a quick lunch. I was taken back by how spicy it was, at first. Just for the record, I love spicy stuff. I feel like I can handle the heat better than the average person. Read the rest of the review after the jump. 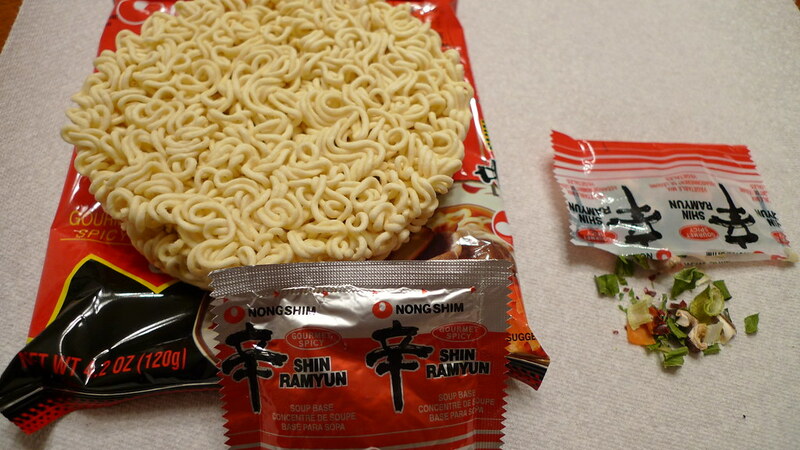 The package comes with the brick of noodles, a seasoning packet, and a packet of dried vegetables. 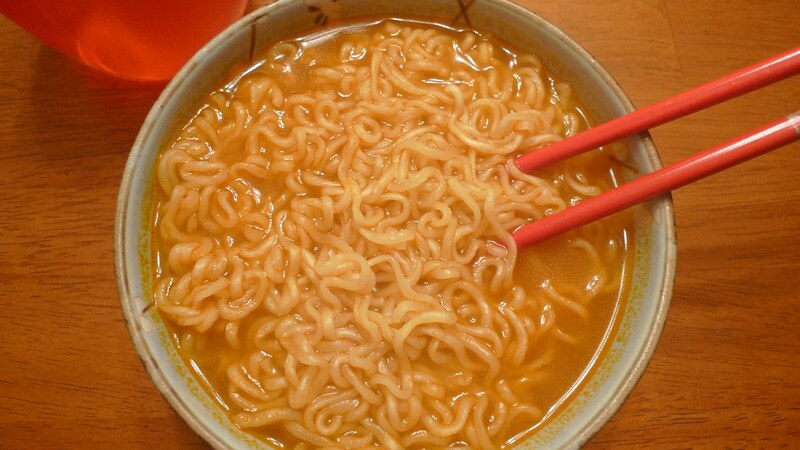 Shin Ramyun is a brick noodle made by Nong Shim which is a food company in South Korea. It's been made since 1986 and is exported to over 80 different countries around the world. 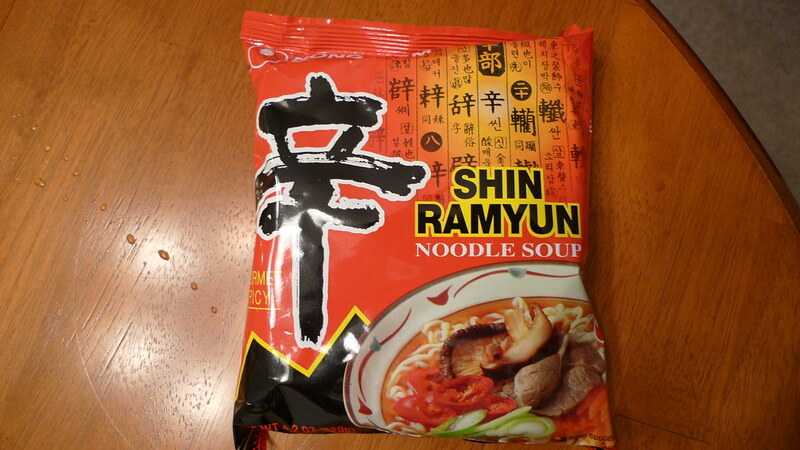 It goes without saying that Shin Ramyun is Korea's highest selling brand of noodles. 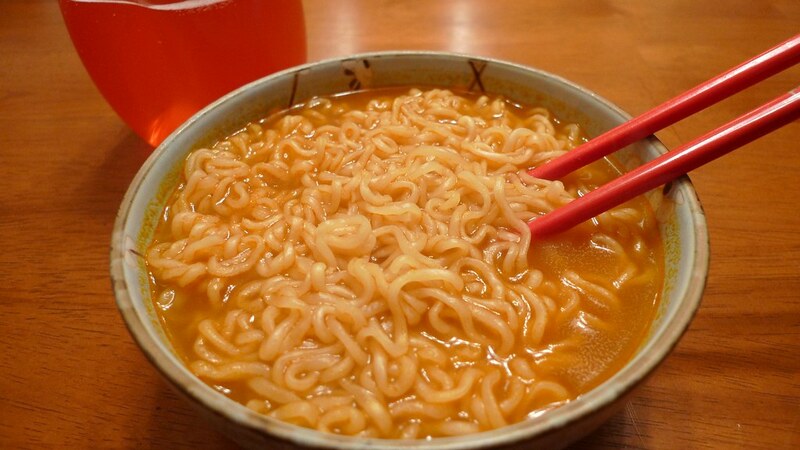 "Ramyun" is basically Korea's word for ramen. Shin Ramyun is really good. The first thing you need to know is that it's spicy. And I mean, spicy. 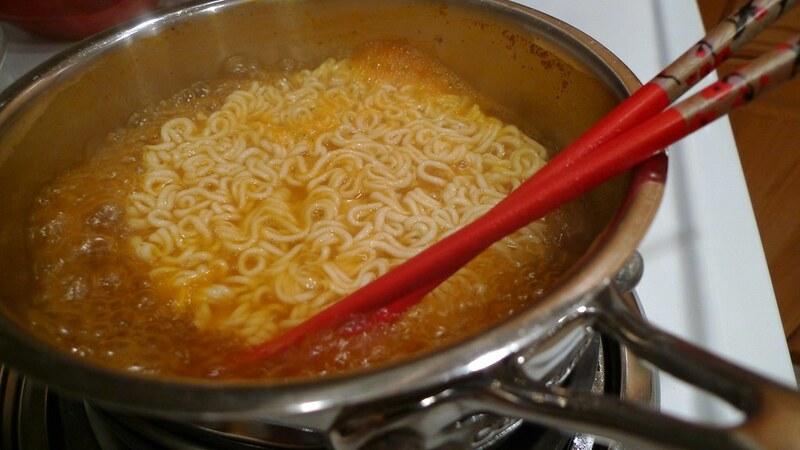 It's one of the spiciest instant noodles out there. The broth has a slight beef flavor, but you mostly taste red pepper. There's dried red pepper seed oil in it. If you look in the seasoning packet, all you'll see is red. The broth comes out red. It's almost certain that you'll be sweating or having a drippy nose when you're done with your serving. 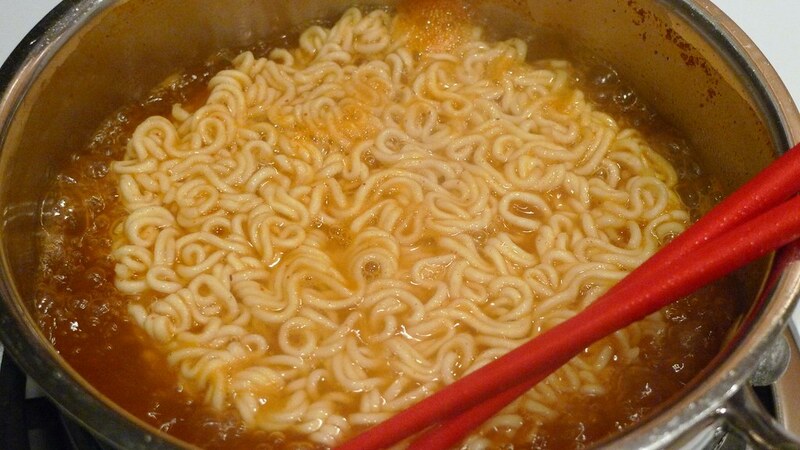 The noodles are the same shape as Top Ramen's noodles, but they're a bit thicker and cook more al dente even though they have a longer boiling time of 4-5 minutes. They come in a circular brick instead of a squared one. They absorb the broth quite well and you're sure to get some spice in every bite. 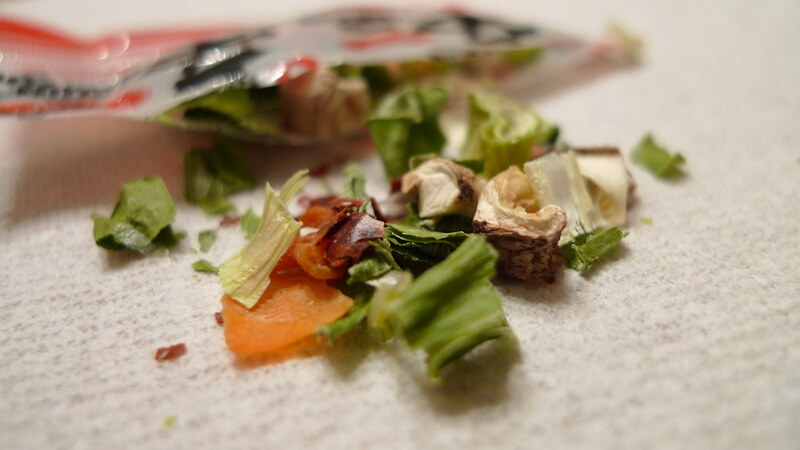 Shin Ramyun comes with a dried vegetable packet. It has green onions, carrots, mushrooms, and a few other things in it. I know Koreans must like adding kimchi to this soup to add even more spice and some other flavors. You can add that as well, but if you're hoping not to add more spiciness, beating an egg in it would be good. You could also add some mushrooms, thinly sliced beef, or roast beef lunch meat. I made the mistake of letting Juliana try this. She has had some spicy things before, but I should have known better. She had a few bites of Shin Ramyun and went into a coughing fit. After that, she didn't want anymore. I gladly ate her share. 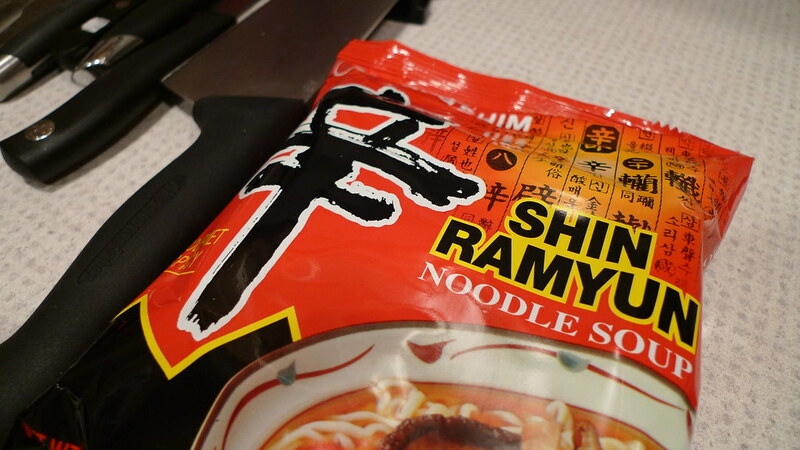 If you are looking for something different, and for something really spicy, go with Shin Ramyun. It's one of my favorites of all-time. Jal meokkesseumnida! Ate these last week.. Very spicy. Tbh I like food a bit less spicy. Spiciness can be adding something to the flavor, but if too present it can spoil the taste for me at bit. Perhaps this dude should just get used to the spice anyway. Ah yes these noodles are bomb. I was a maruchan soup eater for long time but these noodles take it to a whole nother level.